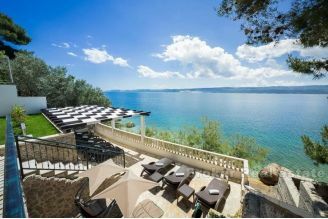 This luxury villa is located in a beautiful location, near the small tourist town on the Omis Riviera, only 40 km from Split and 60 km from the airport. The villa was built on a plot of 720 m2 and covers an area of ​​550 m2. 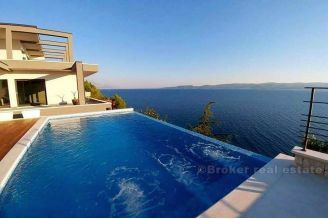 It consists of two spacious living room, kitchen with access to the terrace, large bedrooms, apartments for young people with access to the Japanese roof garden, barbecue, garage (for three cars and a motorcycle), 5 private parking spaces and 2 guest suites that can be independent units in relation to the villa. 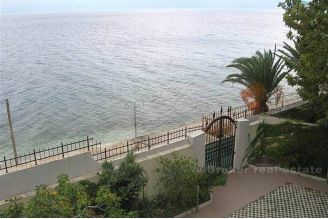 The house offers stunning views of the sea. On the plot, while the construction itself, preserved 11 pine trees aged 35 years. 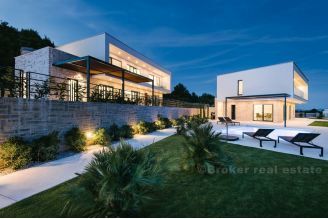 The construction of the villa is currently in full swing, which is primarily related to concrete construction, construction of garages, parking lots and roads, which is located on the front of the house. The renowned construction company is engaged in finishing work and interior design, in cooperation with the customer, special attention will be placed on the wishes and needs of the same. 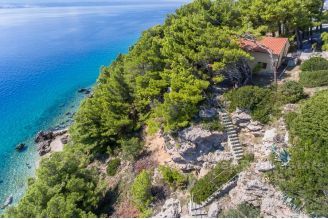 This impressive but simple home has an unobstructed view of the most magnificent coastline in Europe. 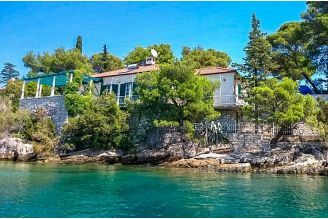 It stretches over five floors, each carefully designed and is allowed to villa used as a whole or can be divided into units that can be rented. The project will include Japanese roof garden, 3 spacious living rooms, 5 en-suite bedrooms a kitchen and a terrace. The appearance of the finished interior will exude elegance, simple textures and clean lines.